For Personal sites, read about MyWeb. Older Departmental and Group websites are hosted on the CampusWeb server. Each share has a test and production capability built-in that enables you to prepare things for the web and be able to view them securely before uploading to the production site. First Connect to CampusWeb then proceed with the instructions below. This is only needed the very first time you set up Dreamweaver. Go to Preferences > New Document and set the Default Extension to “.shtml” if you’re working with the Western Template. Go to Site, New Site (or Site, Manage Sites to edit an existing Site) from the Dreamweaver menu. Select the Site menu item on the left. Select the Site Name input box and type the name of the site you’re interested in working on, such as waterfront in our example below. For the Local Site Folder, browse to the smb mounted file share you mounted for your CampusWeb share and select the matching waterfront folder. Select the Servers menu item on the left hand menu. Click the ‘+‘ icon on the bottom right of the Servers screen. Set the server name to production. Set ‘Connect using‘ to ‘Local/Network‘. To set the ‘Server Folder‘, browse to the smb share you mounted for CampusWeb and select the ‘prod’ folder under the share you’re interested in, ‘waterfront’ in our example. To set the Web URL, append www.wwu.edu/sharename (waterfront in our example) to the http:// prefix. Select Local Info from the menu on the left. 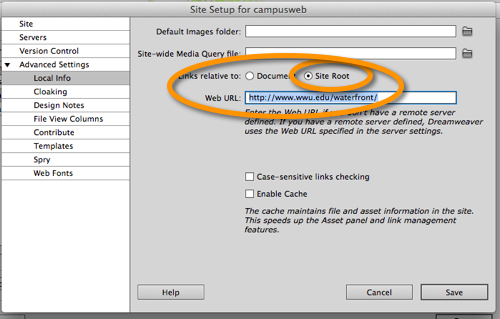 Set web url to http://www.wwu.edu/sharename, waterfront in our example. If you wish to edit directly on Production, just do the above step using …\share\prod in the Local Site Folder above. Then skip setting up the Remote Server as Production below. Select the files you have changed by selecting them in the Files view on your Dreamweaver screen. 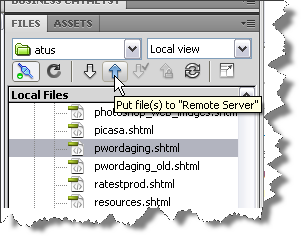 Below you can see that one file has been selected – it is the filename highlighted in grey. If you wish to select additional files or folders, control-click to select the additional lines. When everything you have changed is selected, select the up arrow which turns blue when you select it. When all the files have transferred, open a browser to the your production site and review your edits.